I was inspired today. I saw two gentlemen in their 40s at the pool. They were both working with an instructor to learn how to swim. They made me think about how I take my own knowledge and experience for granted. I also have so much to learn in my own life. As I was leaving, I saw one of the men in the change room. He smiled and exclaimed he was finally learning how to swim. I replied that I thought it was fantastic. Then I asked him, why? Why was he learning how to swim? He told me he had always wanted to learn. He smiled confused and said he wanted to learn so he wouldn’t drown. He thought for a moment and said he was doing it so he wouldn’t die, and he could save his kids if he needed to. “So you’re doing it for your family?” I said. “Yes, I guess I am.” He laughed nodding in agreement. 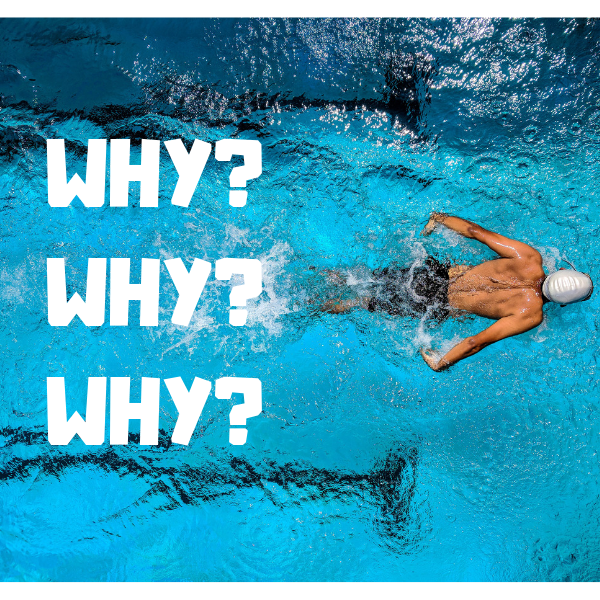 There is so much value in the three whys, man. No, not the three wise men. They did bring some lovely gifts for Jesus though. I’ve started asking why three times in a row to get to the real meaning of my work. I call it my Three Why’s, Man? It usually results in answers that aren’t necessarily about me. When it goes beyond me, it becomes much more important. I think this is a secret to success. To become healthier this year. Because I want to live a long, healthy life. So I can enjoy my later days with Heather, and we can watch our kids become adults. I’m not swimming for me. I’m swimming for them.